Each analytical reasoning question is a logical puzzle, based on a given set of conditions. Each question has exactly one correct answer. Analytical reasoning questions are designed to measure ability to figure out and understand a structure of relationships and to draw logical conclusions about the structure. It is asked to make deductions or conclusions from a set of statements, conditions or rules that describe the relationships among given entities such as persons, places, things or events. Who is sitting with passenger A? No formal training in logic is required to answer these questions correctly. Analytical reasoning questions are intended to be answered using knowledge, skills, and reasoning ability. Analytical reasoning questions are presented in groups of 4 or 5 questions. Each group is based on a short passage followed by a set of conditions. Sometimes the short passage is replaced by graph/table. Simplify the information by using abbreviations and symbols: First step is to strip away all of the excess verbiage from the given passage and then to abbreviate the remaining key words with single letters. In this way the whole sentence can be abbreviated by letters. Conditions also should be represented by symbols/letters. The following is a basic set of symbols, which are commonly used. 'A' represents the statement "Akbar is going". 'B' represents the statement "Babur is going". 'S' represents the statement "Saleem is going"
~ Not ~A Akbar is not going. A ∧ ~B Akbar and Babur are going. Akbar is going and Babur is not going. A ∨ ~B Akbar or Babur is going. Akbar is going or Babur is not going. (A ∧ B) → S If Akbar is going then Babur is going. If Akbar and Babur are going, then Saleem is going. ↔ If and only if A ↔ B Babur is going if and only if Akbar is going. Some Basic Logic Facts: Consider A and B are two statements. A is true means ~A is false. ~A is true means A is false. (A ∧ B) is true means both A and B are true. (A ∧ B) is false means either A or B or both are false. (A ∨ B) is true means both A or B or both are true. (A ∨ B) is false means both A and B are false. ~(A ∧ B) is equivalent to (~A ∨ ~B). ~(A ∨ B) is equivalent to (~A ∧ ~B). (A → B) is true means: "If is A true B is also true. ", "If A is false B may be true or false." (A → B) is false means: "A is true and B is false." (A ↔ B) is true means: "If is A true B is true. ", "If A is false B is false." (A ↔ B) is false means: "If is A true B is false. ", "If A is false B is true." (A ↔ B) is equivalent to [(A → B) ∧ (B → A)]. Which of the following could be true? If only one of the answer choices could be true, then each of the other choices must be false; that is, each one must violate at least one of the given conditions. Which of the following must be true? Since only one of the answer choices must be true, then for each of the choices, either it is false or it is possibly (but not definitely) true. You have to choose only that choice which is definitely true. Which of the following cannot be true? Since only one of the answer choices cannot be true, then each of the other choices could be true. The correct answer is the only choice, which violates at least one of the given conditions or is otherwise inconsistent with what you know must be true. How many possibilities are there? This question asks, "How many different ways are there to satisfy all of the given conditions?" Here, you must systematically count or list all of the possibilities that do not violate any of the given conditions. Identify the keywords that limit the situation: Here are some frequently used keywords. Note: Certain keywords have only one function, to rule out a potential ambiguity. Eliminating the choices is a good strategy: While eliminating the choices, first of all, eliminate those which are ruled out by individual conditions. Then work through the remaining choices. Study conditions for what they imply: To understand the questions correctly, you must understand not only what the conditions state explicitly, but also what they imply. Organizing the given information in a list or table: Often the key to answer analytical questions is to organize yhe given information in a list or table. Use simple diagram, picture or map: On some analytical reasoning questions, an excellent way to deal with the information is to draw a simple diagram, picture or map. This is particularly helpful when you are dealing with the physical or temporal order of things. Work in Sequence: Some people prefer to answer first those questions about a passage that seem less difficult and then those that seem more difficult. It is not good to start another passage before finishing one begun earlier, because it is time consuming to return to a passage and to reestablish familiarity with its relationships. Avoid Wrong Judgment: Do not assume that because the conditions for a set of questions look long or complicated, the questions based on those conditions will necessarily be difficult. Avoid the wrong judgment, work in sequence and try all questions. Avoid your own Assumptions: Do not introduce unwarranted assumptions in the given conditions. Alaways base on the given conditions and facts only. e.g., don't assume that if A is taller than B then A has more weight than that of B. Treat Every Question Independently: Test taker must treat each question separately from the other questions in its set; no information, except what is given in the original conditions, should be carried over from one question to another. Tasks and Performance: Two sales persons K and M, visit their territories T1 and T2 in 4 days, Monday through Thursday. Grouping: A commander forms a troop from 4 soldiers - A, B, C and D. Each soldier has a particular strength. Sequencing: Bus-2 arrives after Bus-3 but before Bus-1. Topologies: A city has 4 towns and each town is connected to at least one other town by roads, some of which are connected by intercity railway track. Careful reading and analysis are necessary to determine the exact nature of the relationships involved. Fixed Relations: Some relationships among the entities are fixed and cannot be changed unless stated in any other question about the same set of conditions. e.g., R and I always sit next to each other. Or R stays at Lahore and I at Karachi. Such relations are easily manageable by fixing the entities in the diagram of the question. Variable Relations: Some relations are variable. The test taker is actually, asked to adjust the variables correctly for the right answer. e.g., Zahid must be assigned to either window 1 or window 3. The questions base on the adjustment of such type of relations. Implied Relations: Some relationships that are not stated in the conditions are implied by and can be deduced from the stated set. e.g., If one condition about boxes on a shelf specifies that Box 1 is to the left of Box 2, and another specifies that Box 4 is to the left of Box 1, then it can be deduced that Box 2 is to the left of Box 4. Flight 1 has its ends at A and C, and passes through B only. 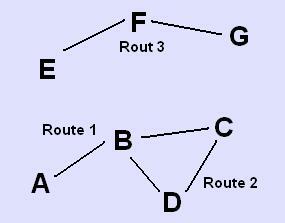 Flight 2 has its ends at B and C, and passes through D only. Flight 3 has its ends at E and G, and passes through F only. Directly connected cities are those cities between which there is no other city to land any flight. Which of the following city is directly connected to the most other cities? Diagram clearly shows that city B is directly connected with most other cities. The right choice is A.